Woo Hoo! We’re Ledge Walking! This morning one of the four nestlings at the Cathedral of Learning reached a milestone. He walked off the nest onto an adjoining ledge, his first big step toward flying! 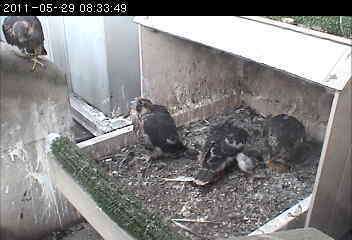 Starting today, if you don’t see all four nestlings on camera, don’t worry. They’re ledge walking. Since they’re going to be off camera, the best way to see them will be at Schenley Plaza. Come to Fledge Watch!